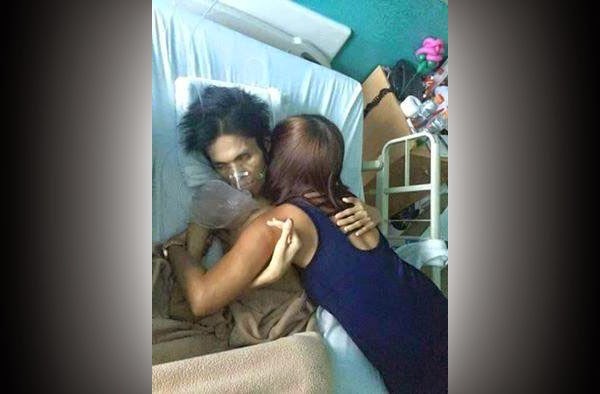 Jam Sebastian, one-half of the online sensation Jamich, looks so thin and very ill in a viral photo that received over 80,000 amens to date. The picture, which was uploaded last Tuesday, February 17, shows Jam tightly hugging a woman, believed to be his mother, Maricar. The uploader, Ako'Si Bhimbo A. Ore III, told his Facebook friends to "Pray for JAM" and "type Amen." As of 8 p.m. today, the number of comments containing the word of declaration of affirmation already reached 81,300. Post by Ako'Si Bhimbo A. Ore III. It means netizens are praying for the recovery of the internet star, who is undergoing treatment at St. Luke's Global City for a lung cancer he was diagnosed of in March last year. The deadly disease, reports said, has already spread to his bones. Earlier this month, Jam told his family that he already wanted to give up the fight. According to his older brother, Yexel, the cancer-stricken celebrity texted them to consider euthanasia or mercy killing to end his suffering. Jam also told his mother several times that he wanted to quit and rest as he is already getting very weak and exhausted, but Maricar asked him not to give up. Last February 14, Valentine's Day, Jam's fiancée, Mich Liggayu, had set up a flash mob outside the Eastwood Mall as her surprise gift for the ailing YouTube sensation. Asked during an interview with Rappler why she wanted a flash mob, Mich said if more people will celebrate, it will be happier, and they will feel the energy and love even more.